If you live in an area that has recently experienced a good deal of flooding, you might be considering elevating your home to keep it safe from future water damage. Even if you have not experienced water damage before, if your home is in an area designated as a flood plain, new laws may require you to lift your home in order to be covered by flood insurance. Even if you find a contractor whom you like who specializes in lifting homes, you may have a number of questions about the process and what to expect. One big question to address at the outset is what the cost of lifting your home might be. Even if you have a quote for the overall cost, there might be fees and costs that emerge during the process that the quote does not cover. It is a good idea to talk to your contractor and read your paperwork carefully to find out what additional costs could come up. You should also ask your contractor how long the process should take and what types of things could make it take longer. You cannot live in your home during the process of elevating it, so knowing the anticipated timeline can help you make a better plan. 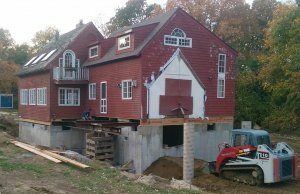 A contractor who has a lot of experience elevating homes can give you an accurate estimate and may even include it in the quote if you ask. You may also need to consider taking out additional insurance to cover the process of raising your home. Your contractor should also carry insurance, but it generally covers issues caused by the contractor and not those that may be pre-existing issues about your home, such as structural problems. Insurance companies often sell short-term plans to cover substantial work like lifting a home, so call yours to see if they have policies to cover lifting homes.